Dr. LeFalle-Collins will discuss the trajectory of creating objects for display and function within communities of self-taught African Americans, from the slavery era to the present. “Called many things from folk art, self-taught, visionary, to outsider art,” says LeFalle-Collins “whatever the category ascribed to these works, they have in common a shared cultural identity, traditional art practice, and a lineage that undergirds artworks by many contemporary black artists.” The Good Luck Gallery’s exhibition of historical woodcarvings by Elijah Pierce and Leroy Almon (on view June 9 – July 15) will be contextualized in the broader framework of African and African American art. Questions and conversations welcome! Dr. LeFalle-Collins has taught at Tuskegee University, Mills College, Oakland, and the San Francisco Art Institute. She was the first Visual Arts Curator at the California African American Museum Los Angeles and has created exhibitions for San Francisco Museum of Modern Art, the American Federation for the Arts, New York, and the Museum of the African Diaspora, among many others. This entry was posted in just folk events, just folk happenings, self taught art on June 18, 2018 by JustFolk Manager. A farmer guides a plow behind his stoic mule, three men cheat at cards, a snake with rhinestone eyes slithers through the grass, and enslaved men and women hunch over their labor in the fields under the watchful eye of a blond overseer. The Good Luck Gallery is honored to partner with Just Folk and Cavin-Morris Gallery for an historic exhibition of master African-American woodcarvers Elijah Pierce (1892-1984) and Leroy Almon (1938-1997) opening June 9, 2018. Two significant twentieth century folk artists, Elijah Pierce and Leroy Almon each grew up in the Southern United States but would make their homes and their marks in Columbus, Ohio. Each would use his craft to further his religious and social mission, with Pierce serving as mentor to the younger Almon. Elijah Pierce, the son of a former slave, was born in Baldwyn, Mississippi into a deeply religious family. At the age of sixteen he opened a barbershop, and after many years straining against his religious upbringing, finally embraced his traditionalist Christian vocation. He became a minister while continuing to carve and barber, with each practice serving and supporting the other two. 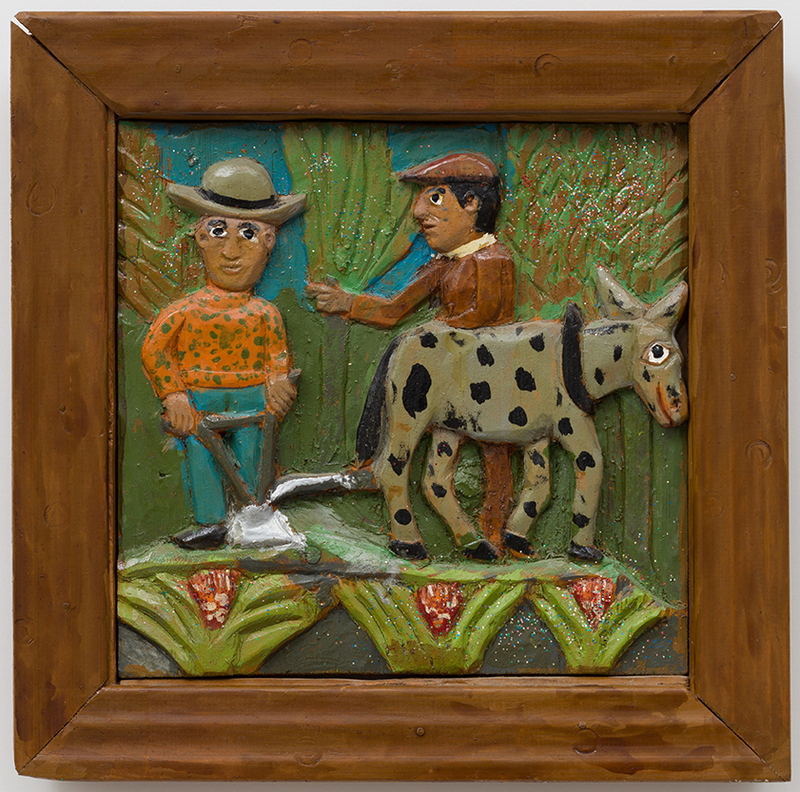 While animals and domestic scenes remembered from his childhood continued to appear in Pierce’s work, he also expertly conveyed stories, sermons, and his own deeply personal spiritual history in the form of carved wood panels. It was into this tradition that Leroy Almon was indoctrinated. 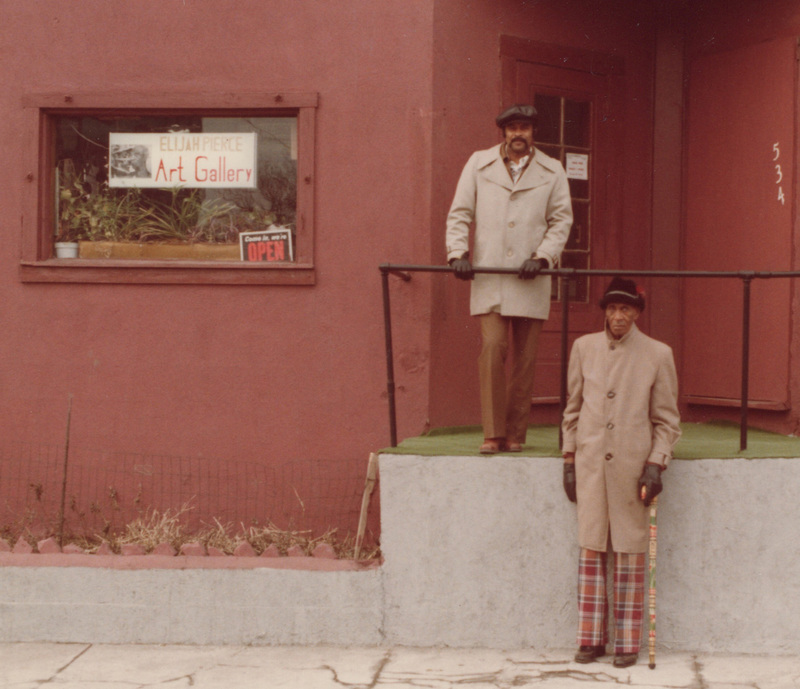 Born in Tallapoosa, Georgia, Almon met Elijah Pierce and began his work as a wood carver in adulthood. At various times a shoe salesman, Coca-Cola employee, and police dispatcher, Almon too, would eventually find his vocation as a minister. Many of his relief wood carved panels reflect his religious proclivity, exploring themes ranging from famous historical subjects, slavery, and racism, to gambling and promiscuity.Both artists gained recognition within their lifetimes, though Pierce was in his seventies by the time museums and collectors began to take note. In 1972 Pierce was shown in the Members’ Penthouse of The Museum of Modern Art and in 1982 he received the National Heritage Fellowship from the National Endowment of the Arts, following his inclusion in Black Folk Art in America, 1930–1980 at the Corcoran Gallery of Art in Washington, D.C. Serving as an invaluable record of twentieth-century America, Almon and Pierce’s carvings are in the permanent collections of the Smithsonian American Art Museum and the California African American Museum, among others, and were featured in The High Museum’s exhibition A Cut Above: Wood Sculpture from the Gordon W. Bailey Collection 2016. Carvings of tigers, hippos, and snakes unite with bas-relief carved story panels in this timely exhibition that explores identity, community, popular culture, and religion in powerful, personal style. This entry was posted in just folk events, just folk happenings, self taught art on June 14, 2018 by JustFolk Manager.